Please contact us with the contact form to report difficulties, strange behaviors or persistent problems, and quote the program name or the number 22218 . This is the download page for Ezi Accounting - Ezi Accounting is the easy to use accounts and invoicing program for small to medium sized businesses. Used internationally, with resellers in more than 50 countries. 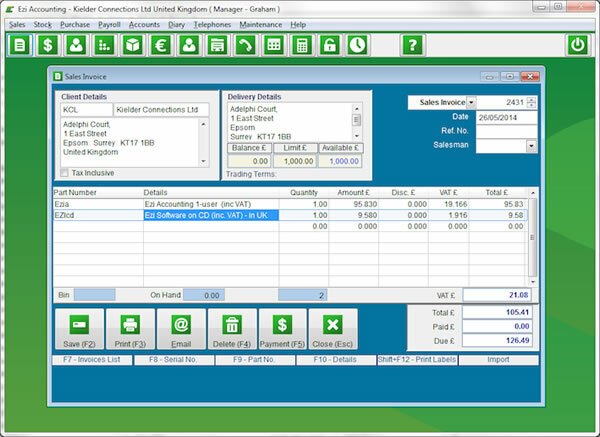 Featuring a simple user interface with multiple security levels, a reasonably priced accounting solution with no annual licence fees when purchased. Available as a download with a free 90 day full function evaluation. Options for rental for 6 or 12 months. Supports workstations on Windows 10, 8, 7, Vista, and Windows Server. First user costs USD179, each extra user for a company costs USD50.